SWITZERLAND: From his native Africa to the United States, tributes poured in from top leaders around the world Sunday after UN chief, Nobel Peace Laureate, and “diplomatic rock star” Kofi Annan died at the age of 80. The Ghanaian national was a career diplomat who projected quiet charisma and was widely credited for raising the world body’s profile in global politics during his two terms as head of the UN from 1997 to 2006. The first Secretary General from sub-Saharan Africa, Annan led the United Nations through the divisive years of the Iraq war and was later accused of corruption in the oil-for-food scandal, one of the most trying times of his tenure. Annan “astutely guided the United Nations organisation into the 21st century defining an ambitious agenda that had made the UN truly indispensable to peace, prosperity and human dignity around the world,” Annan’s successor as UN secretary general, Ban Ki-moon, said in a statement. Annan’s family said he had passed away peacefully on Saturday after a short illness. 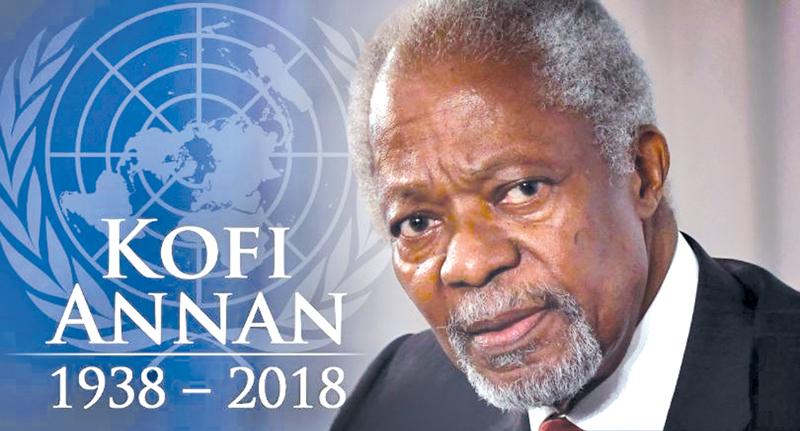 Annan, who lived not far from the UN European headquarters in Geneva, died in hospital in the German-speaking part of the country, Swiss news agency ATS reported. Current UN chief Antonio Guterres described his predecessor as “a guiding force for good”. “In many ways, Kofi Annan was the United Nations,” he said. “He rose through the ranks to lead the organisation into the new millennium with matchless dignity and determination.” The UN said it would fly flags at half mast at all of its locations around the world through Tuesday. And Ghana’s President Nana Akufo-Addo announced a week of mourning for “one of our greatest compatriots”. In 2001, as the world was reeling from the September 11 attacks in the United States, Annan was awarded the Nobel Peace Prize jointly with the world body “for their work for a better organised and more peaceful world”. Born in Kumasi, the capital city of Ghana’s Ashanti region, Annan devoted four decades of his working life to the UN and was the first chief to rise from within the organisation’s ranks. In 1993, he took over as peacekeeping chief -- a position he held through two of the UN’s darkest chapters: the Rwandan genocide and the Bosnian war. His tenure as UN Chief was tarnished by a 2005 investigation of Annan and his son over the oil-for-food scandal, seen by some as payback for his comments that the 2003 US-led invasion of Iraq was “illegal”. An inquiry cleared Annan of any serious wrongdoing, but found ethical and management lapses linked to his son Kojo’s ties with a Swiss firm that won lucrative contracts in the oil-for-food scheme. Annan later admitted the scandal had sorely tested his mettle not only as secretary general, but as a father. Despite the lows, he left the post as one of the most popular UN leaders ever, and was considered a “diplomatic rock star” in international diplomatic circles. After ending his second term as UN chief, he kept up his diplomatic work, taking high-profile mediation roles in Kenya and in Syria, and more recently leading an advisory commission in Myanmar on the crisis in Rakhine state. He enjoyed some success in ending post-election turmoil in Kenya in 2007, and on Saturday the two main players in that crisis, former president Mwai Kibaki and his opposition rival Raila Odinga celebrated his efforts. Annan resigned from the peace mission for Syria in 2012 after just a few months, saying a Security Council stalemate had turned it into a “mission impossible”. He also set up his foundation devoted to conflict resolution and joined the Elders group of statesmen which speaks out on global issues. But he had recently spoken of his despair at the state of global leadership and the lack of will to engage in resolving crises. “Honestly speaking, we are in a mess,” he told AFP in an exclusive interview last December, warning that “today, leaders are going in the wrong direction... leaders are withdrawing.” Despite his criticism, current and former world leaders voiced their admiration for Annan. Russian President Vladimir Putin hailed his “wisdom and courage”, while German Chancellor Angela Merkel celebrated the “exceptional statesman in the service of the global community.” President Donald Trump had yet to comment, but the US ambassador to the UN Nikki Haley said Annan “worked tirelessly to unite us and never stopped fighting for the dignity of every person”. 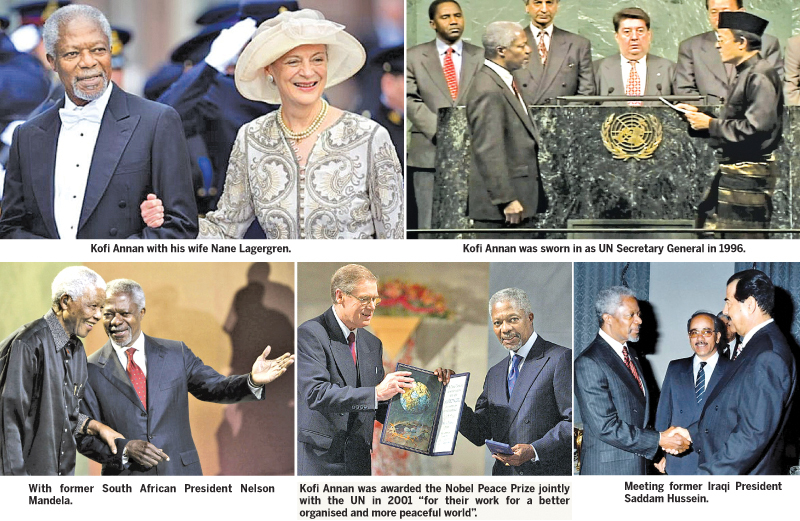 Former US president Barack Obama earlier said Annan “embodied the mission of the United Nations like few others”.